I know what you're thinking: We've seen this before. Trust me, you haven't. Even if you think you have, you haven't. Since the rebuild began, there have been five editions of the New York Islanders. This year's squad represents the sixth, and they're easily the best one yet. Not that the Isles haven't made strides over the past few years, because they absolutely have. Young stars John Tavares, Michael Grabner, Kyle Okposo and Travis Hamonic have continued to mature. With Ryan Strome, Nino Niederreiter, Griffin Reinhart and Kevin Poulin in the wings, more young help is on the way. Matt Moulson has gone from a career-AHLer to a consistent 30-goal scorer. Matt Martin, David Ullstrom and Casey Cizikas are developing into excellent role players. Despite all that, each of those years, the Isles found themselves drafting anywhere between first and fifth overall pick. Why? Because the Islanders are doing something that, for the entire duration of this rebuild, they never could: They're overcoming the adversity that's been thrown their way. The Isles nearly blow a 4-0 lead, surrendering three third-period goals to red-hot Tampa Bay, but head coach Jack Capuano (who, by the way, just seems like a smarter, more well-versed hockey coach right now) calls a timeout and they find a way to hold the fort. In the very next game at Toronto, they fall behind 3-1 early, only to storm back with a vengeance and beat the Leafs, 7-4. On the road, they dart ahead 2-1 against a very tough Bruins team, only to lose 4-2. Two nights later, they watch their 4-2 third period lead evaporate in Winnipeg and end up falling to the Jets in overtime. So of course, they buckle down, swiftly and soundly defeating the Penguins 4-1 on national television, in a city where they'd lost 13 of their previous 14. To me, that's what stood out more than the win itself. 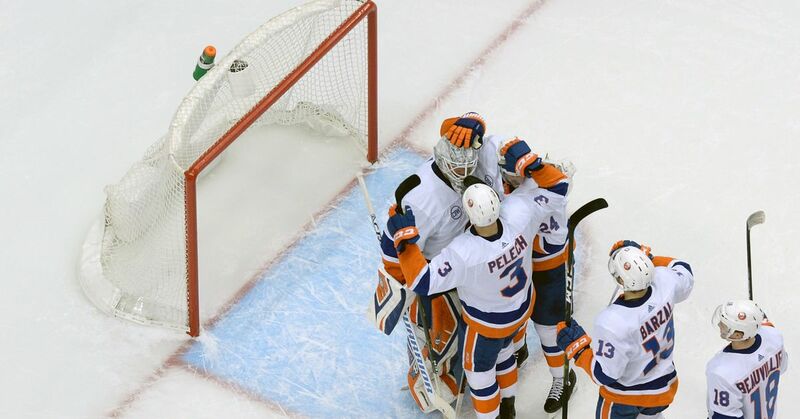 The Islanders were able to shake off a disappointing loss and bounce back against the PENGUINS...IN PITTSBURGH. This bouncebackability, this resiliency is precisely the type of thing that signifies a maturing hockey team. Yes, the offense has flourished, as I always maintained it would, even when half of you called me insane, and the other half suggested I make an appointment with an optometrist. The defense still needs to get better. I'm not going to deny that. Maybe the arrival of Lubomir Visnovsky will help. I will point out that having Evgeni Nabokov between the pipes has been a major benefit. It seems, even on some of his less-than-outstanding nights, that he always gives his team a chance to stay in the game. B.D. Gallof wrote an outstanding piece this morning that goes along the same positive lines as this one, with a comprehensive breakdown of the Islanders in terms of personnel. I'm not writing this to compete with Gallof, I'm writing this because you could churn out 10 of these articles and it still wouldn't be enough to accentuate what's happened here. As Gallof correctly states, "there will be bumps in the road." But perhaps that road's gotten just a bit smoother.